Dying young? Better live fast — if you’re an ant. Myrmica scabrinodis. Photo by Myrmecophilie. Among the many things I hope you’re thankful for — whether you’re U.S.-based and celebrating Thanksgiving this week, or you’re feeling generally grateful regardless of geography and time — you can add to the list the fact that you’re not an ant. Worker ants are essentially enslaved to the task of helping their mother, the queen, reproduce. Any individual worker is disposable, in support of that broader task of the whole colony. And it’s not as though the workers don’t seem to be aware of this — to the extent that a worker ant can be “aware” — at some level. An experiment described in the current issue of The American Naturalist demonstrates pretty clearly that, when workers are injured, they take greater risks — as you’d expect if they’re trying to give the colony the greatest possible benefit from their shortened lives. The study itself sound logistically tricky, and maybe a bit mean-spirited, but as an experiment it’s elegant. A team of Polish researchers started by going out into the forest to collect ants — Myrmica scabrinodis, a common European species — and setting them up in artificial colonies. In each case, the team set up pairs of artificial colonies with equal numbers of workers collected from the same natural source colony, and supplied these transplanted workers with a queen and some larval ants to tend. Which, apparently, the captured workers were perfectly happy to do after about a day of acclimation. Within each artificial colony, then, the researchers injured half of the workers. They did this either by exposing the ants to carbon dioxide for an hour and a half, or by breaking off their propodeal spines — pointy projections from the rear-ward part of the ants’ thoraxes. 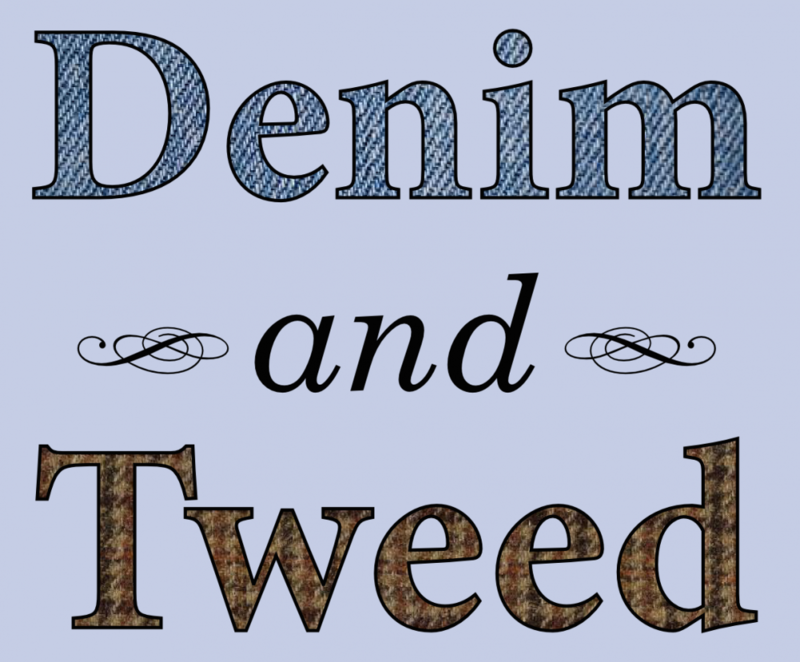 Neither of these treatments left the workers unable to work, but they both have the effect of shortening their lifespans. Within each pair of artificial colonies, then, the team chose one colony to present with a “risky” condition. All the colonies were connected via a PVC passageway to a small foraging arena where the ants could gather food. Risky conditions, in this context, were one of three possible variations on the basic colony design. First, there could be a much longer passage to the foraging arena; since, in the wild, more time spent outside the nest means more time vulnerable predators. Second, the passage could be heated up to a temperature that would be uncomfortable to ants. Third, the foraging arena might contain workers of a competing ant species — which were kept from actually attacking by a mesh barrier, but still able to interact with the ants from the experimental colony. So, for each pair of colonies, one had a riskier path for workers to take to collect food. And in each colony within the pair, half the workers had been gassed or maimed. The collaborators allowed the ants a couple days to acclimate to the artificial colonies, then closed off the foraging arenas to capture the ants that were out collecting food, and tallied up how many were injured (individual ants were identifiable by dots of paint). And, consistently across colonies and the three different kinds of risk, the foraging arena in the riskier colony of each pair contained a larger proportion of injured workers. Moroń D., Lenda M., Skórka P., Woyciechowski M. 2012. Short-lived ants take greater risks during food collection. The American Naturalist. 180:744–750. DOI: 10.1086/668009. 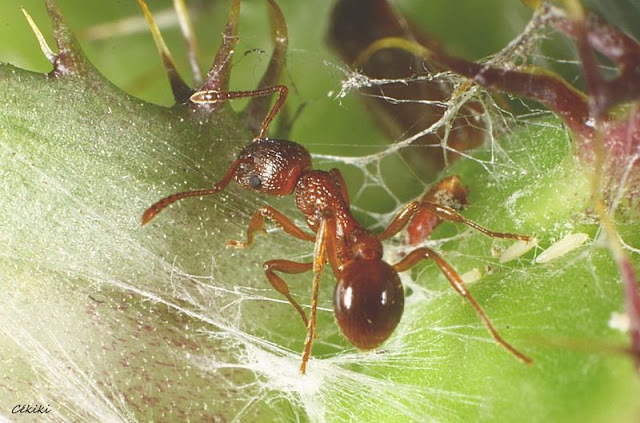 Via Scott Chamberlain: A species of ants that lives in and around carnivorous pitcher plants isn’t entirely freeloading. They also clean the walls of the plant’s pitfall trap, keeping it nice and slippery for insect-trapping. Double the mutualists, double the fun? For all living things, information is critical to survival. Where’s the best food source? Is there a predator nearby? Will this be a good place to build a nest? It probably shouldn’t be surprising, then, that lots of animals do what humans do when faced with a host of hard-to-answer questions—they take their cues from their neighbors. Red-backed shrikes place their nesting sites near where other shrike species have set up territories. Many bird species recognize each other’s predator alarm calls, and respond appropriately. And a new natural history discovery published in the latest issue of The American Naturalist shows that treehoppers let one species of butterfly know where to find ants that will tend its larvae [$a]. The ant-tended butterfly (Parrhasius polibetes, above) looks for ant-tended treehoppers (Guayaquila xiphias, below) to know where to lay her eggs. Photos from Kaminski et al. (2010), figure 2. 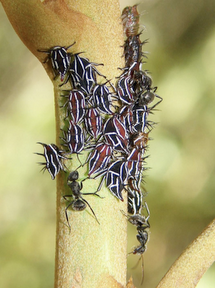 The treehoppers help out the butterfly inadvertently, because both of them are dependent on a common resource: ants. Like many true bugs, treehoppers make their living sucking the sap of a host plant. This gives them a surplus of simple sugars and water, which they excrete as “honeydew” to attract ants for protection. As it happens, the larvae of the butterfly Parrhasius polibetes do the same thing—so the new study’s authors hypothesized that P. polibetes females might prefer to lay their eggs on plants where treehoppers were already present, since those would likely already have ants ready to protect butterfly larvae. To test this, the authors set up experimental pairs of host-plant branches, one occupied by ant-tended treehoppers, and one not. They excluded ants from accessing the unoccupied branch with Tanglefoot, a water-resistant glue used in insect traps. After 48 hours, they checked the experimental plants for newly-laid butterfly eggs, and found that P. polibetes was both more likely to lay eggs, and laid more eggs at a time, on branches occupied by treehoppers. 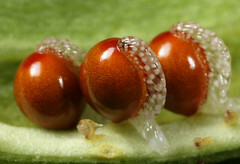 To assess the fitness benefit of laying eggs on treehopper-occupied plants, the authors compared the survival of newly hatched P. polibetes larvae artificially introduced onto branches occupied by treehoppers to the survival of larvae introduced to branches unoccupied by treehoppers (and with ants excluded, again, using Tanglefoot). The larvae placed with treehoppers had substantially better odds of survival—about six times better. These two experiments confound the effect of treehoppers with the effect of ants, however—so the authors performed one additional experiment. In this one, they set up paired branches with and without treehoppers, but allowed ants to reach both the occupied and unoccupied branches—and the general result from the earlier experiment held. Larvae placed near treehoppers were three times more likely to survive for the duration of the experiment even when larvae placed on a branch without treehoppers were able to attract ants on their own. So it looks like P. polibetes is able to freeload on the treehoppers’ ant-attracting efforts, and benefits from that freeloading. What effect does that freeloading have on the treehoppers, or the ants, or the host plant? It’s hard to say based on the data presented in the current paper, but I’d guess that the treehoppers don’t lose much—in fact, they might gain from having another ant-attracting insect nearby, just as the butterfly larvae do. Similarly, it’s probably helpful for the ants to have more honeydew-producing species in the same location. It’s almost like that commercial for … what was the product? I’d think, though, that this pile-on isn’t so good for the host plant, if plants already hosting treehoppers are more likely to have to deal with butterfly larvae, too. Untangling all the different ways these four species—ants, treehoppers, butterflies, host plants—exert direct and indirect natural selection on each other should keep the authors busy for a long time to come. Many insects in the order Hemiptera – the “true” bugs – have evolved a way to hire their own protection by excreting sugary “honeydew.” Honeydew attracts ants, who tend honeydew-producing bugs like livestock, protecting them from predators and even disease. Honeydew is cheap to make because honeydew producers typically make a living sucking the sap of their host plants; they’re trading sugar and water, which they have in abundance, for safety. Camponotus crassus ants protect Guayaquila xiphias leafhoppers, apparently mistaking them for part of their host plant. 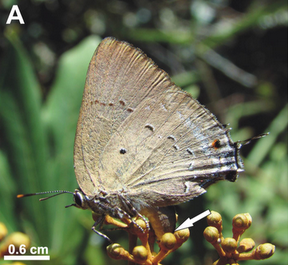 Detail of Silveira et al., figure 1. But there’s a catch. Ants make good bodyguards because they are carnivorous – and they’re perfectly willing to start eating their flock. A natural history note in the latest issue of The American Naturalist suggests that one group of ant-protected bugs deals with this problem by cloaking themselves in chemicals that make the ants think they’re part of the host plant [$a]. The study’s authors determined that organic compounds on the cuticle of the honeydew-producing leafhopper Guayaquila xiphias, which is often tended by the ant Camponotus crassus, were similar to compounds on the surface of the leafhoppers’ preferred host plant. They presented ants with freeze-dried leafhoppers whose cuticles were washed clean with solvent, and found that the ants were much more likely to attack washed leafhoppers than unwashed ones; the ants were also more likely to attack leafhoppers they found on plants other than the preferred host. Finally, the authors replicated the earlier experiments using moth larvae coated with leafhopper cuticle compounds, and found that the “chemical camouflage” conferred the same protection on a different insect species. This neat result shows how hazardous honeydew-producers’ relationship with their ant bodyguards can be – they have to hide from the ants even as they offer them an inducement to stick around! 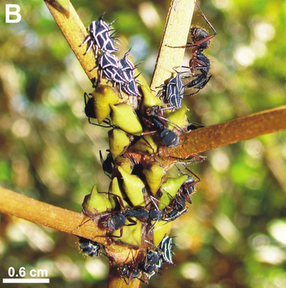 Just released online at Biology Letters: aphid-tending ants have been observed to selectively remove sick members of their “herd” [$-a]. Most aphid species produce some sort of sweet honeydew as waste while feeding on their host plants; ant-attended aphid species use this honeydew to attract ants. In many cases, the ants “milk” the aphids by stroking them to prompt release of the honeydew. While exploiting a colony of aphids, ants defend it as a food resource, protecting the aphids from predators. Aphid species that commonly rely on ant protection often lack defensive adaptations [$-a] found on species that don’t interact with ants. 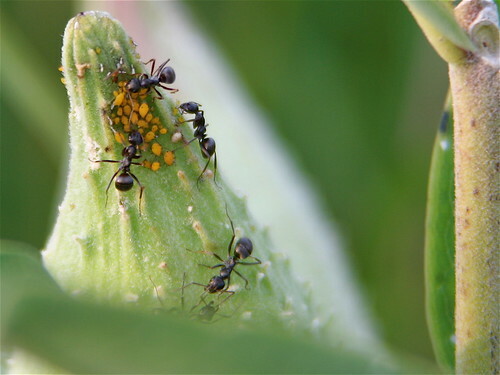 Ants tend aphids on a milkweed plant. Photo by dmills727. Ants were more likely to remove live aphids contaminated with fungal spores (conidia) than live aphids without spores. The authors speculate that this behavior is a re-application of ants’ treatment of their own sick and dead within the colony. It seems clear that it should have benefits to both ants and aphids in this new context, slowing or preventing the spread of the fungus within an aphid colony. This benefit isn’t directly tested by Nielsen et al., but such an experiment is a logical next step. New in the always open-access PLoS One: turns out that a great way to make new species, if you’re a plant, is to have your seeds dispersed by ants. This is because ants aren’t very good at seed dispersal. Seed dispersal by ants, or myrmecochory, works very much like dispersal by fruit-eating birds and mammals: ant-dispersed seeds typically have a fatty attachment, called an elaiosome, that looks tasty to ants. Ants collect elaiosome-bearing seeds, bring them back to their nest, pry off the tasty bit, and then discard the rest of the seed. This leaves the seed safely underground in an ant-midden, ready to germinate — a great way to dodge seed-eating critters and avoid competition from its parent plant and siblings [$-a]. I didn’t learn about myrmecochory until after I’d finished undergrad — which is surprising, because it was going on under right my nose every time I went out into the Appalachian woods near campus. Lots of wildflowers [$-a] have ant-dispersed seeds, including bloodroot, touch-me-not, and good old trillium. It’s an extremely popular dispersal mechanism, having evolved independently multiple times on every continent except Antarctica. Really, me not knowing about myrmecochory is kind of like not knowing about fruit! Ant dispersal is also associated with increased species diversity. In the new article, Lengyel et al. use a classic analysis method called sister group comparison to test the hypothesis that ant-dispersed plant groups contain more species than the most closely-related plant group. And they do, by a long way: on average, myrmecochorous groups contain twice as many species as their non-myrmecochorous sister groups. Why is this? As the authors conclude, it’s probably a side consequence of ant dispersal — ants don’t move seeds very far from where they collect them. So myrmecochorous plants, like Appalachian salamanders [$-a] and tropical white-eyes [$-a], make lots of new species not because their unique characteristics give them some adaptive advantage (although, to be sure, there are advantages to ant dispersal), but because ants do a lousy job moving seeds between populations, leaving them free to follow their own evolutionary trajectories. Lengyel et al. argue that myrmecochory is a key innovation, a trait that helps a group of organisms spread and diversify in the process evolutionary biologists call adaptive radiation. Based on their results, I have to agree — ant dispersal is strongly associated with evolutionary diversification. But the speciation that myrmecochory promotes is an accident, a side effect. We often think of key innovations promoting speciation by adaptive means, by allowing one group of species to outcompete others. Clearly, however, a key innovation can also be a trait that makes the accident of speciation a little more likely.